If you’re planning to buy a new TV, either upgrading your old telly to large screen 4K, or simply anticipating the upcoming FIFA World Cup and other sporty events, it’s time to rejoice: we reckon this could be the most exciting year in television since John Logie Baird first plugged in his cathode ray tube. A slew of new televisual technologies are revitalising picture performance and functionality. Today’s UHD TVs do far more than their predecessors, often for less wedge, and with greater style (just don’t talk about 3D, that’s been binned off by everyone). So what sets should you be looking out for? To help, we’ve summarised the best upcoming offerings from the world’s biggest TV brands, by performance and value. With a picture tuned in Tinsel Town, or at any rate, using expertise from that neck of the woods, Panasonic’s 2018 OLED flagship looks to be a stunning performer. Available in 55-and 65-inch screen sizes, it combines a sensational AV performance, with high quality connected smarts and a Freeview Play tuner. The FZ952 should be the best performing HDR model from the brand yet. In addition to HDR10 and HLG, it also supports HDR10+, the rival dynamic metadata format to Dolby Vision. This means that HDR processing changes to suit each scene – indeed, each individual frame, at least in theory – of a movie. Early samples exhibit flawless near black detail performance, in addition to OLED’s traditional pure blacks, plus a wide gamut of highly accurate colour. Audio is usually where flagship flatscreens fall foul, but it's almost as impressive as the visuals here. The FZ952 comes with a Dynamic Blade speaker bar influenced by Panasonic's high-end audio subsidiary, Technics. This docks directly into the TV pedestal and assails your ears with an array of four woofers, a quartet of mid-range drivers, two tweeters, and a quad passive bass radiator to further boost the bottom end. It sounds seriously impressive. • Early verdict Expect the FZ902 to be a front-runner in any TV of the year speculation. LG has no fewer than ten high performance OLED TVs (Signature G8, E8, C8 and B8, since you ask) ready to roll in 2018, all loaded with leading edge visual and AI technology. We've already looked at the 'wallpaper' W8, which is your proper Lottery win option, but our top tip, for performance gold at a price that isn't mental, is the Signature G8. This 65-incher features One Glass Screen design, which looks exceedingly cool, if a little fragile, powered by the brand’s ThinQ AI and new Alpha 9 processor. The latter promises enhanced fine image detail and accurate wide colours, and what we’ve seen so far has been mind-blowing. ThinQ supports Natural Language Processing (NLP) voice control, meaning you can ask the set “what TV shows are on this evening?” or even tell it turn itself off when the show you’re watching is done. It’s pretty darn clever. ThinQ also works with Google Assistant and Amazon Alexa. As ever with LG, HDR support is expansive, covering HDR10, HLG, Technicolor and Dolby Vision; the set also has an onboard Dolby Atmos decoder, and can bitstream out to an Atmos soundbar or AV receiver. Currently only LG offers this cool home cinema trick. • Early verdict This Signature set is well worth signing up for. If you're after something a little less arduous on the wallet, Samsung is your pal. The Korean mega-brand is panting to bounce back from the beating QLED took from OLED In 2017, with a range of ultra high brightness sets led by the flagship Q9FN, followed by the curved Q8C, Q7N and Q6FN. We’ll be dollars to doughnuts that the 7 series will excite buyers the most, not least because it combines a keen price with plenty of advanced Samsung TV technology. The set will be available in three screen sizes: 55 (the new 'entry level' for lounge viewing), 65 and 75 inches. Samsung continues to turn its nose up at Freeview Play, but its connected platform has all key streaming services and Catch-Up TV players. Last year, Samsung was ahead of the curve when it comes to HDR peak brightness, and this year’s models follow the same shining path, with the Q7FN promising a peak of 1500 nits. That means spectral highlights should really zing. Not only is the screen compatible with HDR10, it’s also HLG and HDR10+ compatible, with QLED guaranteeing an extremely wide colour volume for maximum vibrancy. So save up those Pixar movies for a binge. • Early verdict This is the mid-range 7 Series other brands will be vying to beat. Ignoring the nay-sayers who complain it's not a big enough step up from the A1, we've installed the AF8 atop our list of favourite TVs. However, those seeking Sony style on a more normal-person budget should start camping out for the 55-inch KD-55XF8096. This lush looking set hides its frugality well. The design is just as swish as its step-up sibling, the XF85, and while this is a 50Hz panel, which limits its motion handling capabilities, its cinematic performance is intact. This edge-lit LCD set embraces HDR10 and HLG, and uses a Dynamic Contrast Enhancer to maximise image impact. We love what we’ve seen so far. Also available in 49- (KD-49XF8096) and 43-inch (KD-43XF8096) screen sizes, it boasts wide Triluminos colour plus all the usual Android OS connected frippery, with Netflix, Amazon Prime Video, YouTube and catch-up TV. The XF80 is well connected too, with Bluetooth headphone support and a trio of USBs on top of the usual quartet of HDMIs. It can be operated by Amazon Alexa or Google Home, or you can partner it with Sony’s own LF-S50G Google Home smart speaker. • Early verdict Great Sony images for less; what’s not to like? While the FZ952 is King of the Hill when it comes to Panasonic OLED TV, the cheaper FZ802 may well prove to be the main attraction in the brand’s premium TV line. Available in 55-and 65-inch screen sizes, it shares exactly the same panel as its range daddy (unlike last year’s cheaper Panasonic OLED offering), but adopts a form factor that's easy to live with. With the same Absolute Black Filter and image processing technology as the FZ952, the 802 also boasts Dynamic LUT (Look Up Table) tech, significantly improving the accuracy of bright colours. The only difference between the two models relates to cosmetics and audio implementation, which here is fine but unremarkable. • Early verdict If you don’t need high-end audio, this OLED set could be a steal. 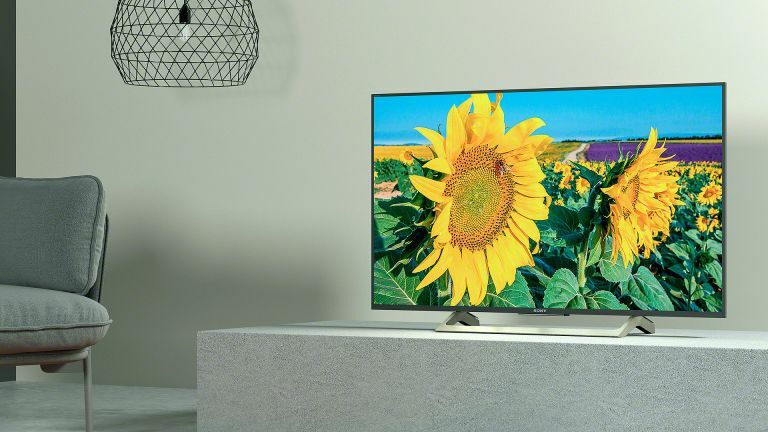 Pistachio ice cream, OLED and Ambilight are three of our most favourite things in the world, and this mid-range corker from Philips combines at least two in an elegantly designed, flatscreen package. Also available in 65-inch guise, the TV features a brushed metallic bezel with widely spaced feet, and looks suitably premium. With three-sided Ambilight, the 803 can create classic pulsating mood lighting to accompany any video and audio content, and also sync with a wider Hue based smart lighting system. Philips' picture processing has impressed hugely of late. The 803 features the brand’s highly rated P5 processor, which does a first rate job maximising colour and detail without looking too garish. Philips quotes a peak luminance of 900 nits, which ensures healthy dynamics. In addition to HDR10 and HLG, the set will also support HDR10+. Audio also impresses, courtesy of a trio of drivers on the back panel. The set features a standard Android OS, and includes 4K capable Netflix, Amazon Video and YouTube. It’ll also talk with Google Assistant. • Early verdict Flashy and fabulous, we expect this Philips to be in short supply. LG has given its LED LCD line a serious shake up for 2018, adding Dolby Vision HDR and Dolby Atmos audio processing to many models. There are no fewer than 12 AI-enabled SUPER UHD TVs heading our way, from the brand’s SK95, SK85, SK81 and SK80 lines. Only question is, which one to audition first? We’re keeping our eyes out for the 55-inch SK850. This SUPER UHD TV, also available in 65-inch and 49-inch screen sizes, utilises an Alpha 7 processor and has a Nano Cell panel, which combines a superior colour performance with strong blacks and a wide viewing angle. The full array local dimming backlight also improves shadow detail and black levels. This 4K champ also offers plenty of HDR, including HDR10, Dolby Vision, HLG and Advanced HDR by Technicolor. LG’s own algorithm, Enhanced Dynamic Tone mapping, is on hand to improve static HDR10 and HLG, giving what LG has dubbed HDR10 Pro and HLG Pro. Early verdict This high performing LED LCD could save you £££s. If ever a TV looked a sure fire bet, it’s the X85. A 100Hz panel, motion handling is expected to be a key strength, making it a great choice for sports fans. Powering the panel is Sony’s trusted X1 image processor, boasting excellent object-based HDR remastering, which gives an HDR lift to SDR content. The set also benefits from 4K X-Reality Pro image enhancement and Super Bit Mapping 4K HDR processing. HDR support covers HDR10 and HLG. The design is slick, with a narrow aluminium frame and oversized anti-wobble stand, while the Android TV OS with YouView ensures key Catch-up and streaming services. There’s also Amazon Alexa and Google Assistant support. The XF85 set is available in 43- (KD-43XF8505), 49- (KD-49XF8505), 65- (KD-65XF8505), 75- (KD-75XF8505) and 85-inch (KD-85XF8505) screen sizes, but we reckon the 55-inch KD-55XF8505 will sell like the very hottest cake of all. • Early verdict The FX85 blurs the lines between high-end and affordable 4K. Panasonic really seems to have got its LED LCD act together for 2018. This entry-level 4K model adopts an upmarket design, and has better than average HDR support, plus a class leading gaming performance. If there is a catch it’s that this isn’t a wide-colour panel, but that's not a shocker, given the price point. In addition to HDR10 and HLG, the set will also support the new HDR10+ dynamic metadata standard, which allows the panel to more accurately tone map HDR images. Admittedly there really isn’t anything much to watch in HDR10+ at the moment, but we’re optimistic that will change. Also available in 65- (TX-65FX600) , 49- (TX-49FX600) and 43-inch (TX-43FX600) screens sizes, the FX600 sports a slim shiny bezel and has a ‘Switch Design’ stand, which allows you to adjust the feet to suit a full width TV stand. Panasonic always delivers when it comes to picture processing, but we suspect this screen might well find its biggest market with console gamers, thanks to a super fast 4K Games mode. • Early verdict Hook up an Xbox One X or PS4 Pro and revel in that responsive clarity. Sitting firmly in Panasonic’s 4K mid-ground is the FX700, which features a fancy metal frame design and some nicely advanced image processing. Unlike the FX600, this model uses a wide-colour gamut panel for additional vibrancy, as well as local dimming with digital control for greater black levels and shadow accuracy. As with other Panasonic 4K HDR models due this year, the FX700 is Multi-HDR capable. That means we get HDR10, HLG and HDR10+ dynamic metadata compatibility. There’s also an HDR Brightness Enhancer for extra shine. Both amazingly thin and nicely turned out, the set sits on a Switch Design stand, allowing you to reposition the feet so they're at the edges or in the middle. It's also available in 65- (TX-65FX700) and 49-inch (TX-49FX700) guises. All this and a blisteringly fast game mode? Panasonic, you’re spoiling us. • Early verdict With vibrancy and style to burn, this is definitely one to shortlist.